This is really the simplest dessert. It has a beutiful clean fresh flavour and is the perfect end to a meal, or just as much of a treat with cup of tea or to share on a picnic. Recipe tested in an 800 watt microwave – adjust cooking times to suit the wattage of your microwave. Alternatively bake in an oven at Gas Mark 5/190°C for 20-25 minutes. Preheat the oven to Gas Mark 6/200°C. Line the flan case with greaseproof and cover with baking beans or uncooked rice. Bake for 15 - 18 minutes in oven until golden brown. Allow to cool slightly and remove greaseproof paper and baking beans. Combine all filling ingredients in a jug. Place flan case in microwaveable flan dish. Pour filling into flan case. Microwave on full power for 5 minutes, then allow to stand for 5 minutes. Check that the centre is firm to touch, cook for a further 30-45 seconds if necessary. 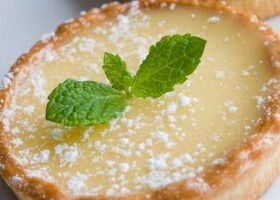 Allow to cool, serve warm or chilled dusted with icing sugar and decorate with thin slices of lemon. Served with whipped cream or ice cream.